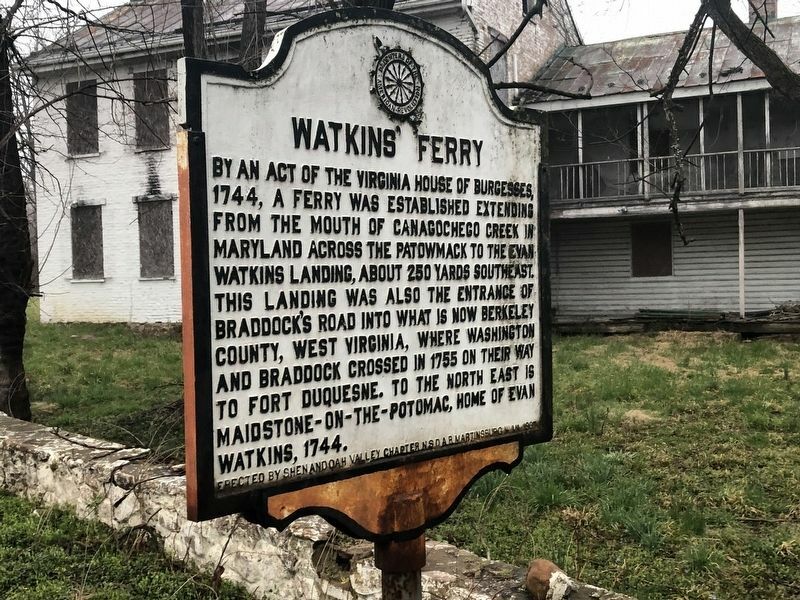 By an act of the Virginia House of Burgesses, 1744, a ferry was established extending from the mouth of the Canagochego Creek in Maryland across the Patowmack to the Evan Watkins Landing, about 250 yards southeast. 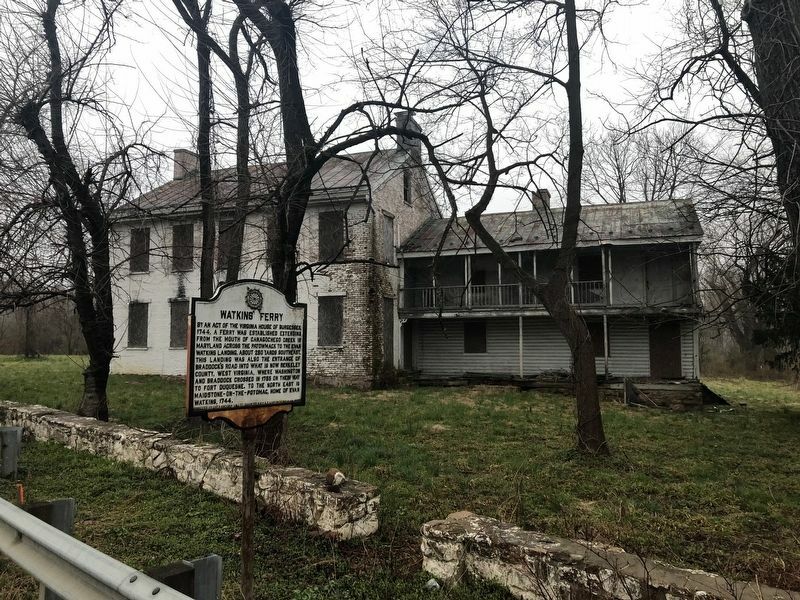 This landing was also the entrance of Braddock's Road into what is now Berkeley County, West Virginia, where Washington and Braddock crossed in 1755 on their way to Fort Duquesne. To the north east is maidstone-on-the-Potomac, home of Evan Watkins, 1744. Erected 1967 by Shenandoah Valley Chapter, National Society of the Daughters of the American Revolution, Martinsburg, West Virginia. Location. 39° 36.018′ N, 77° 49.993′ W. Marker is in Falling Waters, West Virginia, in Berkeley County. Marker is on Williamsport Pike (U.S. 11) east of Ripple Way, on the right when traveling west. Touch for map. Marker is at or near this postal address: 22 Temple Drive, Falling Waters WV 25419, United States of America. Touch for directions. Other nearby markers. At least 8 other markers are within walking distance of this marker. West Virginia (about 300 feet away, measured in a direct line); Williamsport (approx. 0.3 miles away in Maryland); C & O Canal Aqueduct (approx. 0.3 miles away in Maryland); Gettysburg Campaign (approx. 0.3 miles away in Maryland); Cushwa Basin/Williamsport (approx. 0.3 miles away in Maryland); Creating a National Park (was approx. 0.3 miles away in Maryland but has been reported missing. ); Life on the Canal (approx. 0.3 miles away in Maryland); a different marker also named Williamsport (approx. 0.3 miles away in Maryland). More. Search the internet for Watkins' Ferry. Credits. This page was last revised on April 6, 2019. This page originally submitted on April 6, 2019, by Devry Becker Jones of Washington, District of Columbia. This page has been viewed 65 times since then. Photos: 1, 2. submitted on April 6, 2019, by Devry Becker Jones of Washington, District of Columbia.